Enshrined into the Hall of Fame in in 1999, Lawrence Taylor was a league MVP, ten-time Pro Bowler, eight-time All-Pro, three-time NFL Defensive Player of the Year and two-time Super Bowl Champion. He was recently named #3 on the NFL’s Top 100 Players list. This jersey has been conclusively photo-matched to one of the NFL’s most memorable games on November 18th, 1985 against the Washington Redskins. Taylor recorded two of his many career sacks in the game, but the game is best remembered for the brutal injury that occurred to Joe Theismann when Taylor hit him in the backfield. Theismann suffered a compound fracture of his leg in what remains one of the NFL’s most gruesome injuries in the league’s history. On the front left tail is the Sand-Knit manufacturers tag size “44” with an attached flag tag reading the year “85”. Adjacent above is an additional Sand-Knit tag reading “Designed & Tailored Exclusively for the NEW YORK GIANTS”. 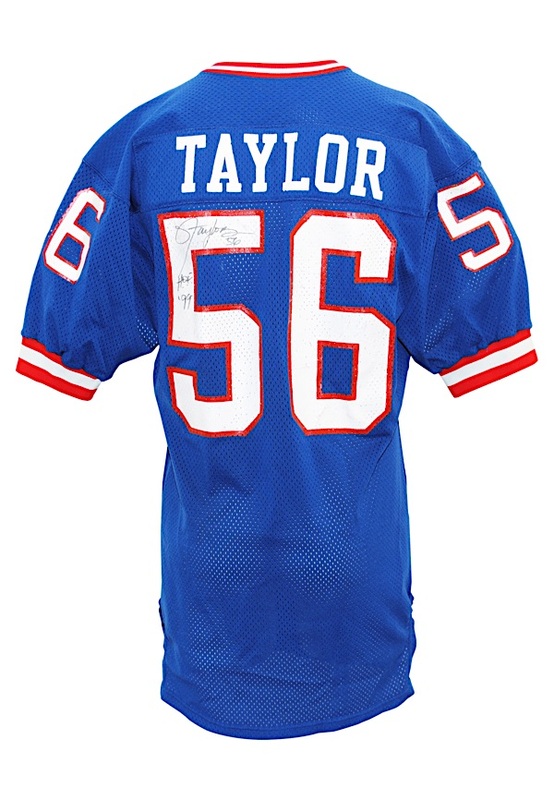 Across the front, back and on both sleeves is the player number “56” painted in white on red. Across the back on a blue nameplate is the player name “TAYLOR” painted in white. The jersey is pounded with numerous team-issued repairs on the both shoulders, helmet transfer marks throughout and some unrepaired holes. Taylor signed on the back inside the player number with the added inscription “HOF ‘99” and in our opinion the signature rates an 8. This jersey has also been conclusively photo-matched to the Wild Card game on December 29th. During that game Taylor recorded a sack in a 17-3 victory over the San Francisco 49ers. You’d be hard pressed to find a better Taylor in the hobby. A historic relic from one of football’s most memorable moments. This jersey is properly tagged, was presented to us as game-used and in our opinion shows outstanding use. Accompanied by a LOA from JSA and a Photo-Match.com LOA confirming the match.